This Anglican church is situated in Farringdon Without, City of London. The church was first founded between 988 and 1070. It is one of two churches, at opposite ends of the City, dedicated to this saint. 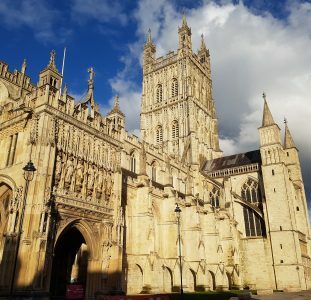 St. Dunstan was a Saxon Abbot of Glastonbury and Archbishop of Canterbury. The medieval church survived the Great Fire of 1666 but was rebuilt in 1830-33 in the Neo-Gothic style to allow for road widening. This new building is different in concept to any other church in the city as it consists of an octagonal building aligned on a north-south axis, with square tower and tall, octagonal lantern. St. Dunstan-in-the-West is one of three churches in England to share it’s building with the Romanian Orthodox community. To the left of the main altar is a chapel closed off by an Iconostasis, formerly from the Antim Monastery in Romania.